How to Work That "Sentiment"
I am sharing two cards that focus on the sentiment. But wait, what about the sentiment? Sentiment-based stamps are becoming more and more prominent in the past few years. With the popular trend in calligraphy-style handwriting, sentiment no longer plays the 2nd fiddle! 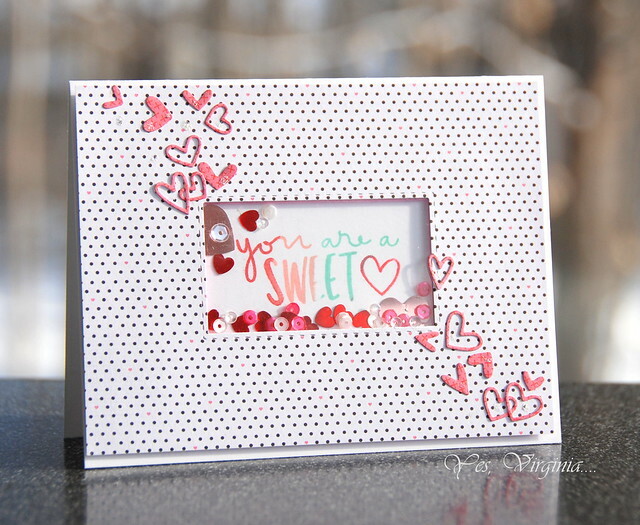 I took out the "Hello Beautiful" set from the February Card Kit and used the sentiment as the focus of my two cards. Using sentiment with the shaker feature is simple yet so effective. Most of you probably have some basic shape dies, such as squares, circles, ovals, rectangles... Have you used them in your shaker card with sentiment? This is one easy one to try. My 2nd card is very colorful. I used a leftover piece (see here) and white-embossed the sentiment. I then took out the pattern paper ( from February card kit) and added the purple with the same markers. This way, the design become more cohesive. While I was at it, I added tiny dots of Flamingo Liquid Pearls in the pattern paper. I strongly encourage you to try the under-used sentiments more in your creations. edited: there is the coupon code "SNOW" that will give you $5 off your Simon Says Stamp order! For limited time only. Thanks for stopping by! If you follow my blog regularly, you know that I love to make my own background paper. Well, this time, I was feeling the Ombre vibe, so I set out to create one. 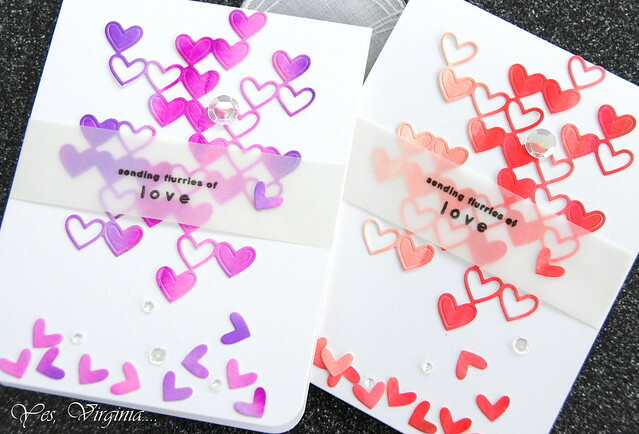 The fun part is putting the Stacked Heart dies onto the card. It has a sophisticated look yet it. is. effortless. I used Spectrum Aqua markers for the DIY watercolor background. You can use Distress Inks, Distress Markers, ZIG Watercolor Markers or any watercolor-based medium to create your own. This how-to photo will help you see/understand my creative process. I chose Spectrum Aqua simply because I have the complete colors of coral/pink and violet/purple. Normally, I am not a purple kind of gal, but the color scheme looks to be very striking. I didn't want to cover up the beautiful shades of colros/hues, vellum seems like a good idea. 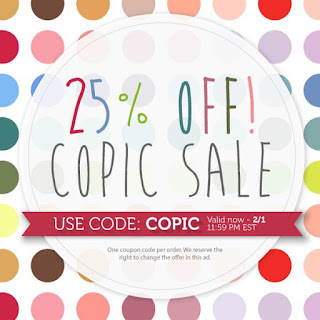 If you have some watercolor markers and watercolor paper, perhaps you can also try this out? Hope that you find this post helpful. A note of thanks to those who use my affiliate links (Simon Says Stamp, Craftsy and Amazon) to make their crafting purchase. I really appreciate your support. This will definitely encourage me to share my latest creative process and best tips right here in this blog. Everything is nicely packaged in a light brown paper bag. This was what it looks like when you spread the entire kit out. Notice that little sucker....? I know, how sweet is that!? You can find out all about the monthly subscription info here. For my first card, I had a play with the stamp set "Hello Beautiful" and stamped a tic-tac-toe. I used two dies (MFT Stitched Square Dies, SSS Stitched Rectangles) to frame it. The Crate Paper Epoxy Stickers are really handy for this. For my 2nd card, I decided to go bold with the pattern paper from the kit. This kit is so versatile that I think I have more ideas swimming in my head after making these two. Stay tuned for more! Please note this kit is currently sold out (boo! ), but you can get each item separately. 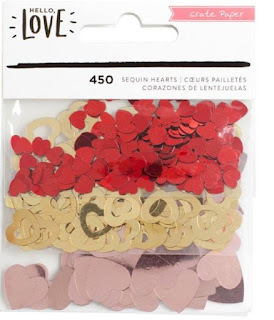 Right now SSS has put the VERY popular sequins featured in the kit on sale! Just $1.50! There is the coupon code "SNOW" that will give you $5 off your order! For limited time only. Thanks for stopping by! Pattern Paper + Intricate Die = ? Leading Lady @ Winnie and Walter --Take Three! Leading Lady @ Winnie and Walter --Take Two! 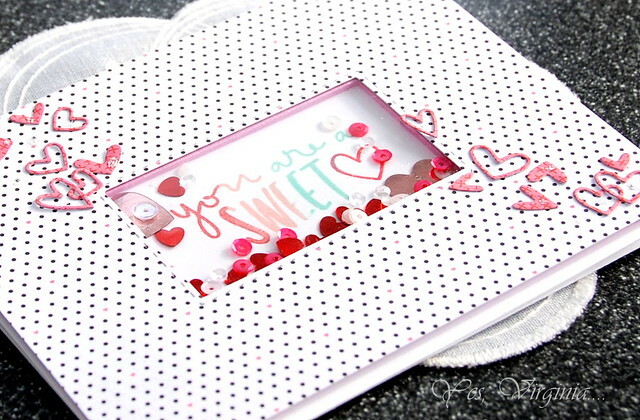 Use Intricate Dies as Stencils! A Flower Card with Minimal Layers! Leading Lady @ Winnie and Walter--Take One! SSS January Monthly Card Kit--TWO cards!